You may still be able to book by calling the hotel at 352-854-1400. 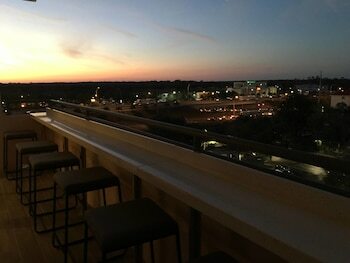 The Hilton Ocala embraces its city -- known as the horse capital of the world -- with quaintness and charm. You'll make friends with the hotel's own Clydesdale, Buddy, as he prances down the promenade with you in his carriage. There's an outdoor pool and fitness facility on this tree-studded, six-acre property, where Buddy's got his own paddock. Rooms have been renovated recently, and are gracious and timeless. Stick with the equestrian theme: consider reserving a room on the Thoroughbred Level, where you'll enjoy a number of extras such as complimentary breakfast, hors d'oeuvres and cocktails in the Private Lounge, and freshly baked cookies. Kick it up another notch and select a suite with separate sitting and sleeping areas, a wet bar and balcony. 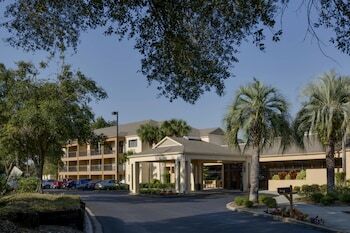 Hilton Ocala is a 3.5-star hotel located at 3600 Sw 36th Ave, Ocala, FL 34474, US . Its nightly price usually falls between $115.26666666667 per night and $256 per night, excluding tax, depending on room category. $115 per night found for a 2 Queen Beds room type. 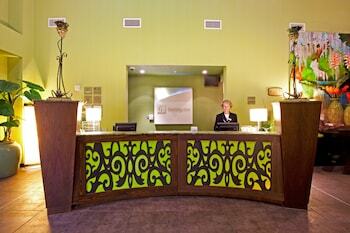 Hilton Ocala sells rooms through sites like Room 77, Expedia, Hotels.com, GetARoom, and many others. Room 77 searches across dozens of different sites to find the lowest discount rates available. The lowest rate we've seen over the last few weeks was found on Room 77. In 1% of the cases we surveyed, all sites offered the same rate. You can compare real-time rates from all of these sites on Room 77. Room 77 is the only hotel shopping site that includes special discounts like AAA, senior, government, military, and corporate rates.